Once the energy bite paste is made, take a heaping tablespoon of it and roll it into a ball. That’s all there is to it! 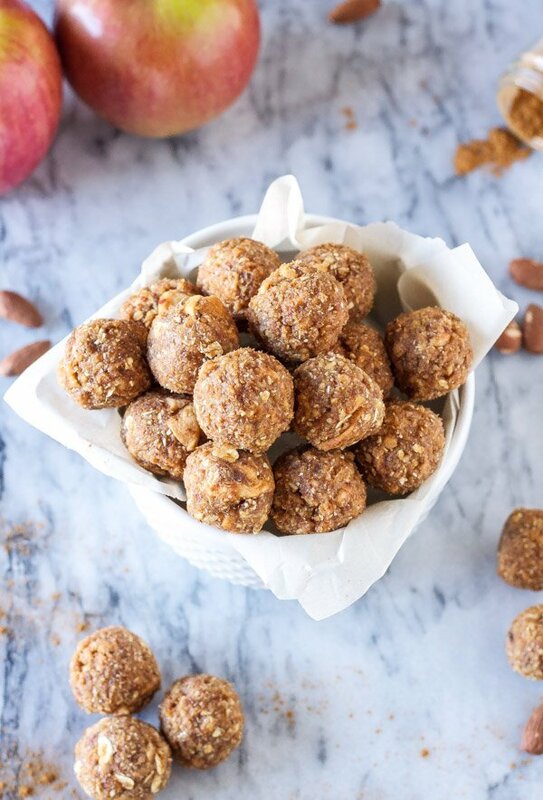 The Cinnamon Apple Energy Bites are best stored in the refrigerator or freezer. I prefer to pull mine right out of the freezer and eat them, but it’s totally up to you. 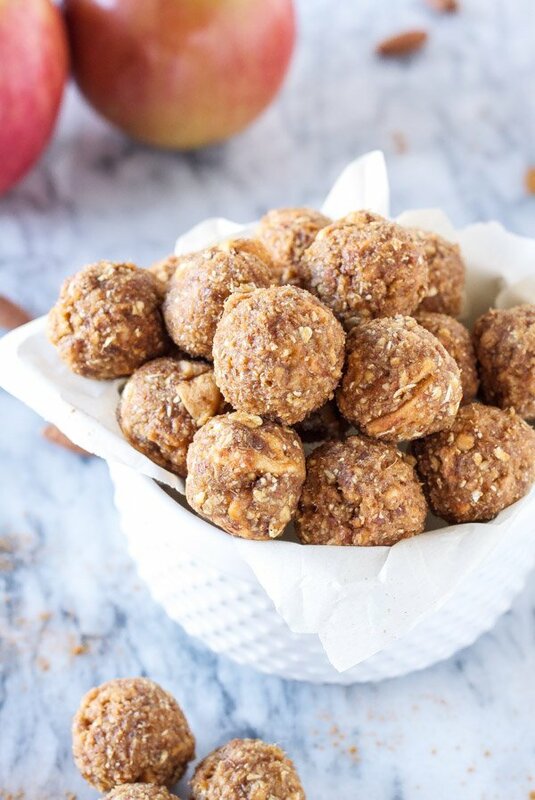 The flavor of these Cinnamon Apple Energy Bites can best be described as having a little piece of apple pie without the crust. The combination of the dates, dried apples, and maple syrup makes these perfectly sweet, and the almonds and oats add a nice nutty flavor to them. 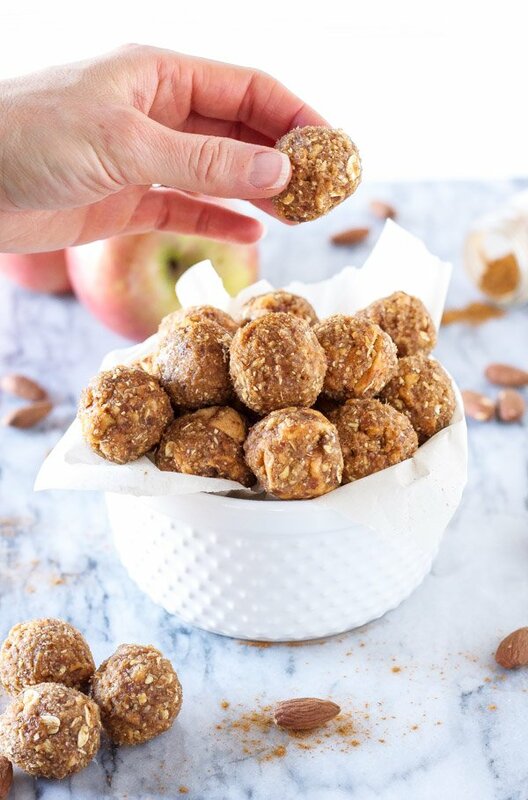 If you are like me and trying to control your cookie and fudge intake this month, then make a batch of these healthy Cinnamon Apple Energy Bites to have on hand for those days when your sweet tooth is calling! Healthy, gluten free, vegan, energy bites that taste just like apple pie! Scoop out heaping tablespoons of the mixture and roll into balls. I'm trying to be really careful during the holiday season, too. There's nothing worse than getting a shock when you step on the scale on January 1st! 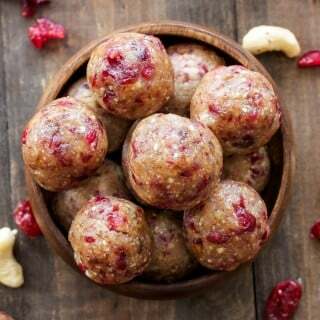 These energy bites are the perfect thing to ward off those sugar cravings. Thanks Dara! January is a scary month in terms of stepping on the scale! These would be perfect to use on the beyond diet plan. But how many of these energy bites is a serving? Thank you for the great recipes! Hi Bernadene! I would probably limit yourself to 2 of the energy bites for a serving, but it all depends on how big of a snack you are looking for. Its so much easier to resist all the treats if you have a yummy alternative you can pop in your mouth instead! 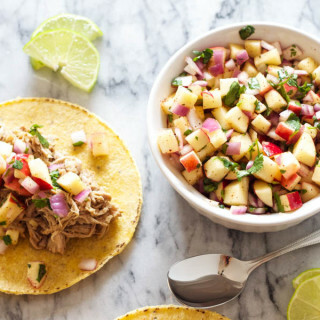 These look awesome - can't wait to try! Thanks Kristen, you are absolutely right! What a great idea! 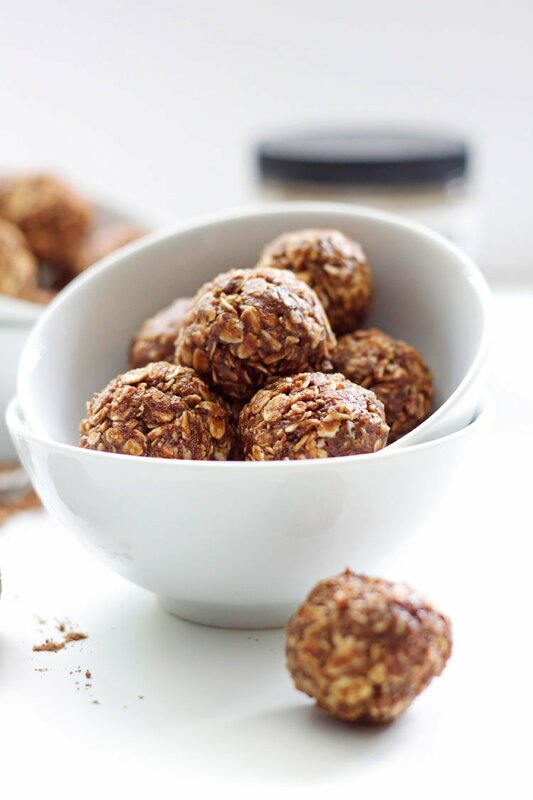 I am always looking for a treat that is naturally sweetened and these are perfect! Thanks Ashley! I love when I can make something with a natural sweetener that tastes as good if not better than one that isn't! Very smart to have these on hand with all the temptation around the holidays! Thanks Sylvie, I need all the help I can get with all the cookies! 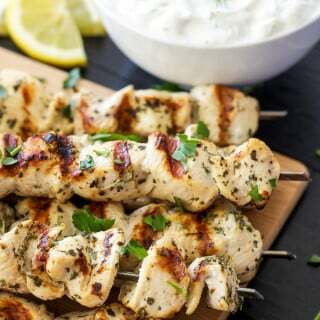 I totally want to snuggle up with these bites.. great flavor and have to smell awesome too! Haha! Me and you both Pamela! I am obsessed with energy bites right now. . love these!! 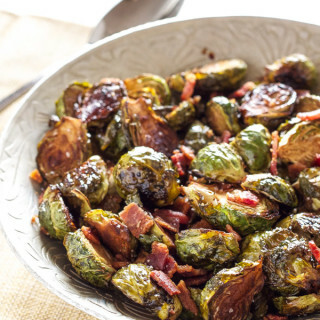 love that you added dried apples and medjool dates! Thanks Alice! 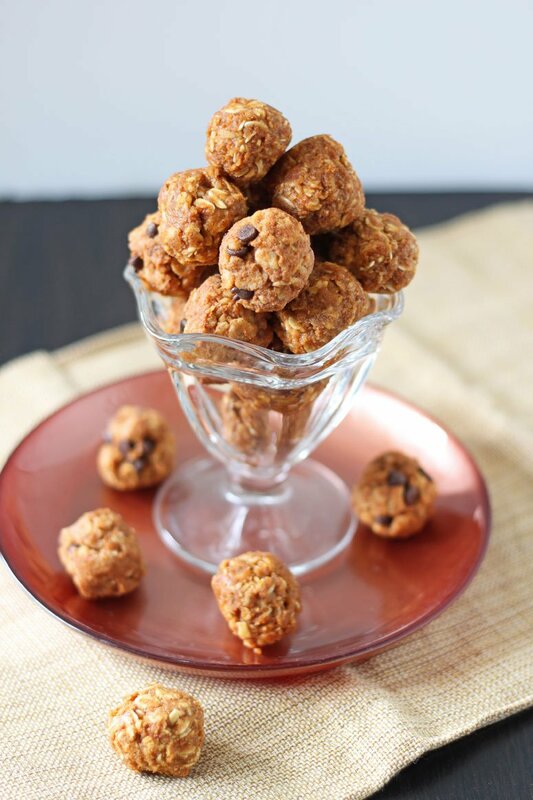 Energy bites are the perfect snack and they are so filling too! 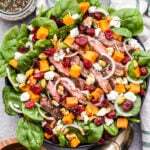 Do the need to be eaten same day or can you prepremake and store for a few more days? You can store them in the refrigerator for up to a week or what I like to do it keep them in the freezer and just pull one out a couple minutes before eating it to let it thaw. 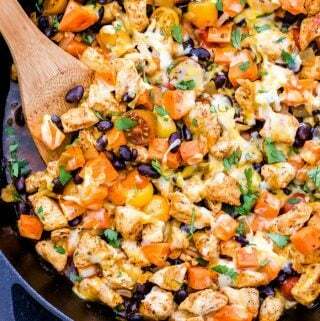 I would like to share this recipe on my fb page. Does the "T in the recipe stand for tsp or tblsp? Hi Amanda! The T. stands for tablespoon and the t. stands for teaspoon. 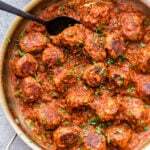 Thanks for sharing my recipe and please add a link back to it. I have figs on hand, do you think those would work instead of dates? Hi Erin, I haven't tried this recipe with dried figs, but I definitely think it's worth a shot. Just make sure to soak them so they soften up and you may need to add a little extra water to the mixture if it isn't combining in the food processor. Let me know how they turn out! These look DELICIOUS!! Mmm. I love dried apples<3 xoxo Sarah Grace, Fresh Fit N Healthy. Do you know if there is anything that I could substitute for the maple syrup? I can't gave any form of sugar right now except natural sugar in fruits. So no honey either. I've substituted bananas in some recipes for honey. Do you think that would work? Is it for the mixture to stick together? Hi Leona! I haven't tried them without maple syrup, but I'm thinking a natural fruit juice without any added sugar such as apple juice could be used a a replacement. You could also just try adding more water, they won't be as sweet, but I think they would still be good since dates are so sweet on their own. Wondering if you need the dried apples for the consistency of the mixture? Could I use apple slices or apple sauce instead? Hi Melissa! I think using the dried apples is important for the consistency of the energy bite. While I haven't tried it with fresh apple slices or applesauce I'd be afraid that they would be too wet and wouldn't hold their shape. Just curious as to the calorie counts of these and of your pumpkin energy bites. 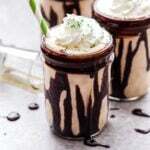 I made these last night and they are fabulous! I'm glad you enjoyed them! When I figured out the calories it came out to about 48 calories per energy bite. Thanks so much, Danae, I appreciate it. Not quite as low calorie as I had hoped, considering they are totally addictive. HaHa! Thank you, thank you!!! My kids and I absolutely LOVE these. They are so easy to make and a great alternative to sugary cookies. A new lunch box favorite. I'm so happy to hear you guys like them Christine! Thanks for trying them out! Is there a way I might fit quinoa into this recipe? I have a vegetarian teen daughter, so I am always aiming for protein. Hi Debbie! I'm not sure how the end result would be, but you could try replacing half or possibly all of the oats with quinoa flakes (Ancient Harvest makes some). 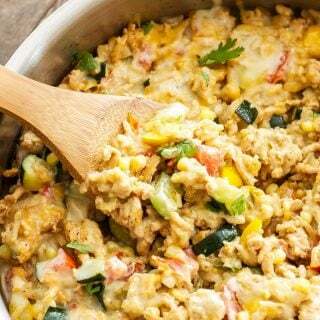 The protein is slightly higher per serving than oats. I haven't tried this myself so I can't guarantee the results. If you do try it I'd love to hear how they turn out. Good luck! Do you think I could substitute dry roasted sunflower seeds for the almonds? My son has a nut allergy, but can eat seeds. Thanks! Hi Katie! I haven't tried replacing almonds for sunflower seeds, but it's definitely worth a shot. I would think you should have similar results in consistency. I hope they turn out for you! Sorry but would you mind explaining what dried apples are if not freeze dried? Also the dates you list....are those just regular dates? Thanks so much! Hi Stephanie. When I say dried apples I mean the chewy ones like other dried fruits such as apricots, raisins, cranberries, etc. I usually buy mine at Whole Foods or Trader Joes, but most grocery stores should carry them. Medjool dates are typically larger than other dates, contain more moisture, and are sweeter. They are the ones I recommend using, but if you can't find them other dates may work as well. You may need to soak them longer and possibly use more of them. Hi! 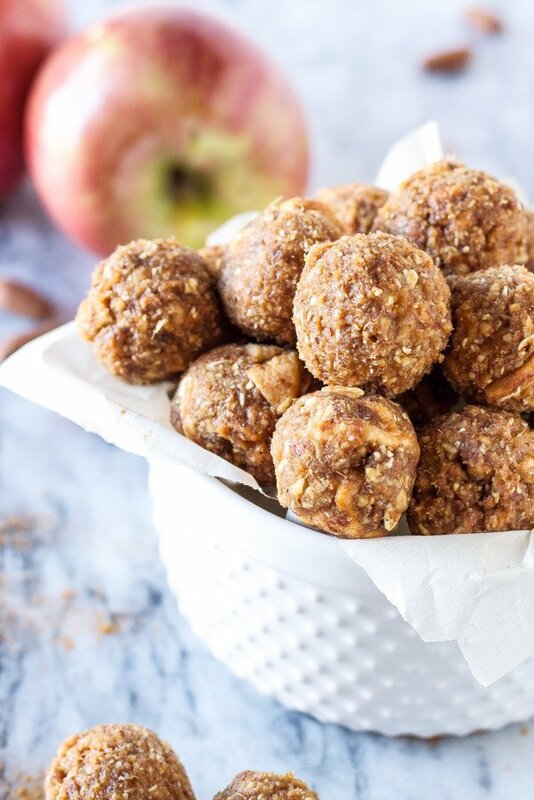 I haven't made these with fresh apples, but I'm afraid they might have too much moisture in them and make the energy bites too wet. If you do try it, I'd love to know how they turn out. These are so, so amazing. I dried my on apples in the oven, and toasted raw almonds in the oven for 10mins, at 350. This resulted in warm, and delicious apple bits. The recipe only yielded a dozen for me, so my only recommendation is to double or triple the recipe, and if you want more of an apple taste, to add 1.5 cups instead of 1. One of my new kitchen staples. What a great idea to dry your own apples and toast the almonds Corinda! I'm so happy to hear you like them! Thanks for the yummy recipe. I ended up making it a few times in a row. The third time, I ran out of almonds and used almond flour (1/2 cup almonds = 1/3 cup almond flour (meal)) and it worked fine. I almost preferred it as there were no hard almond bits to bite down on. I also used 'generic' dates and it worked fine. I think they'd be great snacks to take on a hiking trek. Thanks for trying out the energy bites, they are one of my favorite snacks! Glad to hear the almond meal worked, I'll have to try that out next time I make them! Hi April. I haven't tried making these paleo, but I would suspect that almond meal could be used as a replacement for the oats or any other kind of nut "flour". Love the pop of nutrition in every bite. Thanks Suzanne! They make a great little snack! Hi. The recipe is supposed to be gluten free. But one of the ingredients is fashioned oats. So unfortunately it's not gluten free. What can I take instead of fashioned oats to make it gluten free? Hi, I would love to do this as a program at my public library this fall. Would it be okay if I used your image to promote the program? 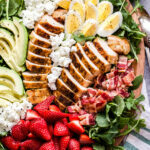 I would leave your blog information on the image and cite your blog for the recipe. Hi Krystal, Absolutely Krystal. As long as the recipe isn't reprinted then I'm ok with it. Thank you for asking! Just wondering why not the freeze dried apples. I am having a hard time finding unsweetened dried apples without sulphites. Hi Monique, You could definitely substitute freeze dried apples if you're having trouble finding regular dried ones that you like. I just chose to use the regular version because I like the chewy texture they add to the energy bite.